A glow in the darkened sky alarmed Wayland Tolman and his father, Orson, as they turned towards home after a long winter’s day of logging near Long Pond (Nubanusit). The date was February 6, 1894. They raced ahead and as they rounded the road to the village their worst fears were realized. Fire! The three-story brick building that housed the hotel, the post office, the store, and the library was ablaze. A large number of people had already gathered to watch. The only fire-fighting equipment in evidence was a hand-held water pump – all they had in 1894 and no match for a fire that was now out of control. 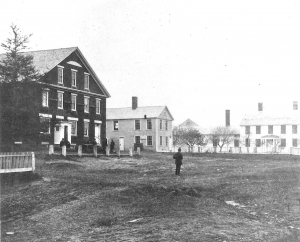 Nelson Village about 1885 with Hotel Nelson (right) and Atwood house (where our Library now is) in rear. Man at far right is “uncle of” Orson and Eben Tolman and boy with small drum is Rob Tolman. Otherwise those identified are l-r: Wilmer Tolman on large drum, Wayland Tolman and Percy Folsom with flutes. Notes by Rodger Tolman. Does anyone know what the occasion was? The fire had started when someone accidentally dropped a lighted sulfur match on a pile of straw matting stored in the attic. Since the library was in the ground floor in a corner of the store, the women who arrived early at the scene had time to carry out the books and also some of the things from the post office. Helen Barker Fletcher recalls in Struther’s Tellable Tales how she raced up to the Priests’ quarters on the third floor to save the clothes of Homer Farnum Priests’ wife, Elsie, by emptying the drawers into a sheet and taking it outside. Another thought brought her quickly back to save Homer’s account books from the store, for there were a lot of unpaid bills due him. At that time accounts were often settled up only every several months by barter or cash. Although they saved the church, the hotel and store building was a total loss. It had been built in 1840 by Ruel Nims as a general store, measuring 60 by 45 feet. In the same year, he built the house on the west side of the common owned for many years by the Gerbis family. Nims was a successful merchant, serving the many needs of Nelson and the surrounding towns. A ledger from Nims’ store for the mid-1860s survives in the Historical Society of Cheshire County. 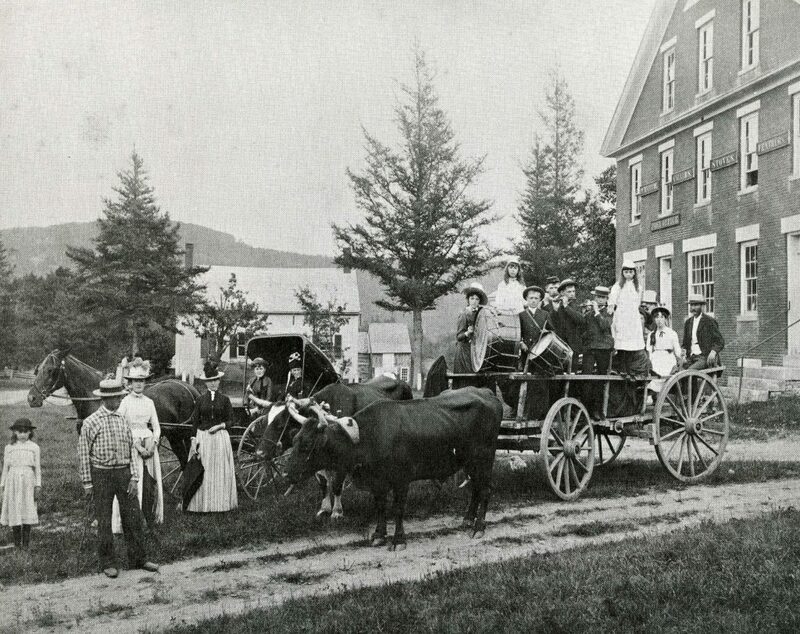 It shows that customers came from towns as far away as Swanzey and Keene to shop in Nelson for a wide variety of goods from buttons and bows and yards of cloth to fish, molasses, and kerosene. Nims also sold trees, grown in his nursery from seeds collected by women and children for which he paid a penny a hundred. According to Rev. Hardy, Nims was succeeded by the firm of Watts and Rand. Watts was a dentist who set up his chair in the southeast corner of the building. Dr. Nehemiah Rand, his father-in-law, had built a house across the street (now owned by the Mackenzies) and served as the town doctor for many years. 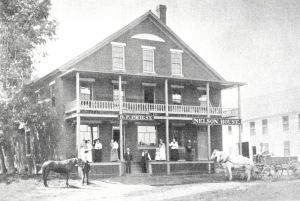 At the time that the building burned in 1894, it was owned by Homer Farnum Priest, who operated a store on the first floor, a hotel called Nelson House on the second floor, and a home for his family on the third floor. Photographs show that the building faced the road opposite the church. 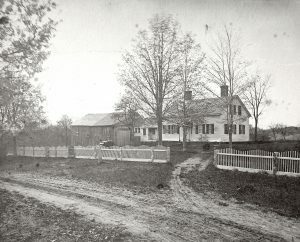 According to Elliot Priest, the son of Homer now living in Manchester, an adjacent long, narrow, two-story structure on the west side between his house and the store called the Center Building was used as a stable and for storage. It survived the fire and was later used, occasionally, to house students during the fall term and, at times, as a tailor’s shop, a shoemaker’s shop, and a country store. 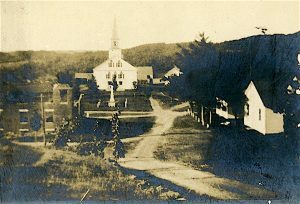 Nims must have considered rebuilding the store and hotel because minutes of the annual town meeting in March of 1895 state that it was voted to forgive taxes for the next ten years on a building to be located on the site of the old one that had burned, but Elliot said that it was never built. Nelson’s great mercantile adventure had ended. Through the generosity of Henry Melville, the unsightly blackened ruins were later removed and the present common established.